Writing computer software requires exacting detail. Proofreading each letter, number, and symbol in the code and checking that it is correct requires a crisp, high-resolution display that a team of programmers can carefully review, line-by-line. Since there is no room for error, the Engineering Information Group of publishing giant Elsevier displays their code for peer review using a Canon REALiS SX7 Multimedia Projector. Featuring HD-quality SXGA+ resolution display of intricate type as small as 7-point, the use of this projector enables the division's entire team of programmers to view the software code as a group on a large-screen, in high-resolution detail. "The crisp display from the REALiS SX7 made this job possible," explained Joel Bernstein, Director of Information Technology for Elsevier's Engineering Information Group. "It's a great way for our programmers to review the code together. The REALiS SX7 was perfect for our needs, and we're going to use it on every project." Prior to acquiring the Canon REALiS SX7 Multimedia Projector, software programmers at Elsevier used plasma screens, but found the image clarity at small-font size was blurry and hard to read. Now, the intricately detailed display provided by the REALiS SX7 eliminates that challenge. The precise imagery found on this projector enables Bernstein to display the code at 10-point font size, which maximizes the amount of text projected at any given time. By using the REALiS SX7, Elsevier programmers can view and discuss the code as a group, which speeds the peer-review process while also making it more efficient. With SXGA+ (1400 x 1050) resolution, 4000 lumen high-brightness, and a contrast ratio of 1000:1, the REALiS SX7 Multimedia Projector provides HD-quality display of type, images, and motion video even in brightly lit environments. The key to the performance is the patented, proprietary Canon AISYS (Aspectual Illumination System) Optical Engine, which maximizes the display power of the advanced LCOS (Liquid Crystal on Silicon) reflective panels built into every Canon REALiS Multimedia Projector. As a result, Canon's AISYS-enhanced LCOS projectors deliver exceptionally detailed, lattice-free, color-accurate images while maintaining a compact form factor. The 4000 lumen brightness of the REALiS SX7 Multimedia Projector is an additional benefit for Elsevier's software peer-review group, as it allows them to display the text with the lights on, giving the programmers the ability to take notes and make revisions during the process. Bernstein noted the programmers projected their software code directly onto a wall, and the REALiS SX7 Multimedia Projector's Auto Screen Color feature instantly compensated for the wall color. Other Auto Set-Up functions include: Auto Keystone, which calculates the angle of the projector and corrects for image distortion; Auto Focus, which employs a sensor on the front of the projector to measure the distance to the screen and adjusts focus as quickly as one second; and Auto Input, which detects the image signal from the input terminal, identifies it as the input signal, and selects it for display. 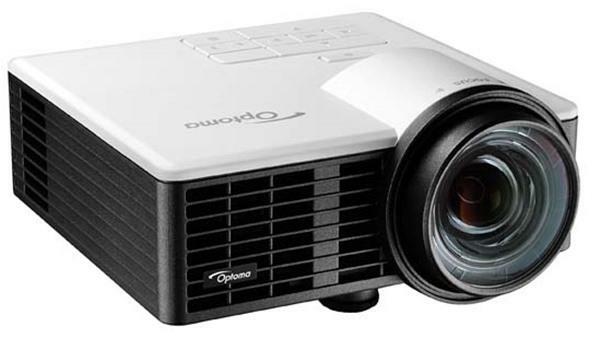 Equipped with a Genuine Canon Optics 1.7x Wide Power Zoom Lens, the REALiS SX7 Multimedia Projector can deliver a diagonal screen size from 40 to 300 inches (with throw distances of 3.9 feet, and 29.5 feet respectively). At only 10.6 lbs. the REALiS SX7 is easily transportable to any presentation location. When the presentation is completed, the convenient "Off and Go" feature allows users to pack-up quickly by simply unplugging the power cord while internal circuitry continues to power the fan and cool the projector. For more information on Canon REALiS projectors, please visit www.usa.canon.com/projectors.